I will not update this map anymore. Feel free to continue this map in the Map editor and re-post it if you like. Event Line + Kingdom Map needs to be fixed. Now that is a beautiful map! Very good map. Looks like good mission. 1). Many cities are trading but 0 open cost and no trade goods is this intended? Did you upload the right one? Or, perhaps you forget to save or change the .map file? I download it but found out that it only require c55/p65/m73 and no population require. I am affraid I did not upload the right version ... Kingdom Map + Event Line is completely wrong. Finally, a beautiful map for Pharaoh!! I swear to god, 99% of the maps I see in this site for Pharaoh is horrible and really just.. painful to look at; even the ones in the game itself. Just ugly. But your map is probably the only beautiful map I've seen here, and I love it. 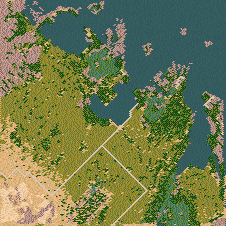 Looking at your map just restored my faith in pharaoh's editor and it's ability to generate actual decent looking maps. I'll probably even start playing the game again just to try out your scenario. I totally feel the same about the quality of the In-Game Maps. They are too simple and they are old fashioned. I am not updating this map any longer. Try my new maps of my Custom Campaign. The Events and Trade Map are unfinished. Feel free to edit this map by your self,and even repost it !